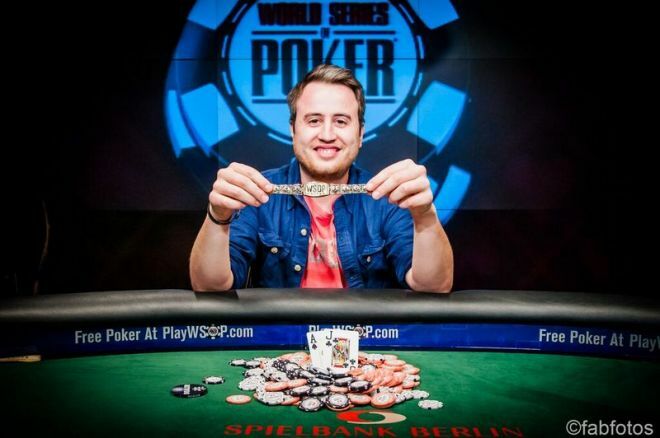 Germany's own Dietrich Fast took down Event #2: €550 "Oktoberfest" No-Limit Hold'em at the 2015 World Series of Poker Europe in Berlin early Tuesday morning, denying the UK's John Gale his second bracelet of the year. Fast won €157,749 and his first WSOP gold bracelet, outlasting a field of 2,144 entries amassed over four starting flights at the Speilbank Berlin casino. "It's overwhelming," Fast told PokerNews moments after the win. "It feels really nice. I can't describe it in words. It's unbelievable. "Since I started playing poker in late 2005, I have always watched the TV coverage of the WSOP. Every summer I look forward to seeing all these people playing in Vegas for the titles and I am happy to achieve it." The final table began just after 4 p.m. local time in Berlin and it wasn't long before Harry Lodge ran a dominated into Steve O'Dwyer's to exit ninth. Jorn Winter then went out eighth when he shoved the against an O'Dwyer open, only to find Rodrigo Caprioli behind with two jacks that held. Soon after, short stack Sandro Wuest doubled up once with an ace, then called all in with pocket queens in a battle of the blinds with Vojtech Cervinka and looked like a lock to do it again. Cervinka had little hope with the , but flopped a gutshot and got there on the river to crack Wuest's queens and send him home seventh. Adrian Apmann then took to shoving his short stack and eventually ran into Cervinka sitting on pocket aces to bow out sixth. O'Dwyer spent most of the day near the top of the counts, but was out fifth when he doubled up Fast twice, then missed with a flush draw versus Caprioli. The players returned from an hour-long dinner break with Fast holding a slight lead over Gale and Caprioli, and Cervinka nursing the shortest stack. Fast simply ran better than the others at this point, busting Cervinka when he called his push with the against the and flopped the nut flush. Caprioli pushed with the in the small blind soon after and Fast woke up with the in the big to send him to the rail third. Facing an uphill climb from the outset, Gale, who was looking for his third WSOP bracelet lifetime, having won his second after returning from a three-year absence to the 2015 WSOP caused by a brain tumor, slowly grinded his way back to the top of the chip counts. But as they moved into the third hour of heads-up play, Fast managed to turn the into fours full of aces to double up into a commanding lead. Gale doubled once from behind, but couldn't do it a second time and had to settle for second. "I thought that I had a huge edge versus him, so I wanted to play Daniel Negreanu-small-ball poker," Fast explained. "I tried it, but I failed. I got really unlucky and I was card dead. Then I was down to 20 bigs, but I fought back and now I am here as the winner." Although it took almost 12 hours of play to book the win, Fast said he plans on celebrating the victory on both sides of the pond as soon as he can. "I will celebrate here in Berlin and I will celebrate next year in Las Vegas," he said. "I am always a guy who will spend some money for some drinks for sure." As the 2015 WSOP Europe rolls on, be sure to stay tuned to PokerNews for continued coverage.